TelyHD to Make Skype Video Calls on TV (Any HDTV) : Skype TV Cam | Free Pc to Phone Calls, Free Voip Calls to India International ! We have already discussed how amazing the experience of video calling on tv is. We also discussed some of the Skype ready television which you can buy (are available in India) and make video calls. Off course that is a very good option, but it make sense only when you are buying a new television. What if you have an old HDTV (which is not Skype ready) and you still want to make video calls on it. It does make sense because even the Skype ready tv does not have any Camera and Microphone, what they have is just Skype installed on the TV. What if we can have a device which has wifi connectivity, has a camera and microphone and also has Skype installed in it. It is like a Skype Box which I just have to connect to television and I can make skype video calls. The answer is Yes! We are talking about a smart skype box by Tele labs, named "TelyHD". It is a tely cam which you can connect to hdtv and enjoy the video calls on your sofa. Use this amazing device to turn any HD TV into a Skype enabled TV. It is WiFi ready with an HD camera and noise canceling microphones. 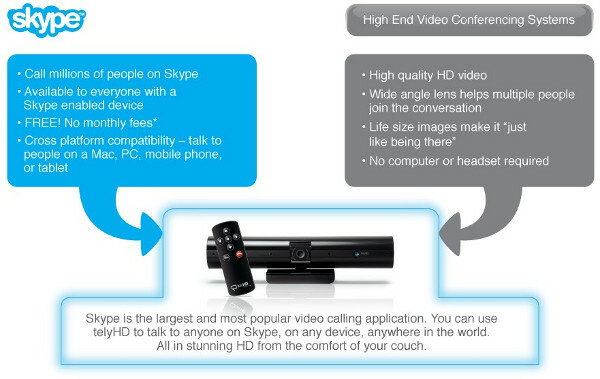 A telyHD is the easiest way to make Skype calls from your living room. Even use your telyHD to instantly share photos and easily send or receive HD video mail. - Works with any HD TV: telyHD works with any HD TV with an open HDMI port and mounts to any TV using an adjustable TV clamp / desk stand. - High quality video and audio: Send a stunning high quality picture in 720p HD video. Four noise canceling microphones eliminate background noise and provide crystal clear audio. - Easy to set up: telyHD is an all-in-one device that has everything you need including an HDMI cable. Set up takes less than 10 minutes. - No computer required: telyHD is WiFi ready (802.11 b/g/n compatible). - Video Mail: Send and receive HD Video Mail when both parties have a telyHD. - Photo Sharing: Insert an SD card or USB memory stick and instantly share photos with friends and family who have a telyHD. - Pan, crop and zoom: Create a more intimate conversation by zooming, panning and cropping the camera angle in order to get the perfect shot. - Built on Android: telyHD is an intelligent stand-alone device that runs on the Android operating system from Google. (Think of it as a tablet computer that uses your TV screen and home audio speakers when you’re on a video call). No monthly fees. HD camera with wide-angle lens and privacy shutter sends up to 720p HD at 30 frames per second. Operating System: Runs on the Android operating system from Google. Processing: NVIDIA’s powerful Tegra 2 with Dual-core ARM Cortex-A9, On-chip GPU with H.264 encoder/decoder; 512MB RAM; 2GB EMMC. Networking: Connect via WiFi (802.11 b/g/n compatible) with WEP, WPA and WPA2 support for password encryption or via 10/100 Base-T wired Ethernet. Audio: Four directional beam-forming microphones capture and isolate the conversation in both small and large rooms.Two built-in speakers ring when someone calls and the video call audio is routed through your TV or home AV system via HDMI. Photo Sharing: Share photos from a SD card or USB memory stick (feature only available if both parties have a telyHD). Power: External power supply. Input:100-240V AC, Output: 5V DCAC. Size: 7.6 (H) x 27.3 (W) x 10.5 (D) cm. Amazing product but the only concern is price. For Rs 17000 ($300) it is slightly expensive. But if you are willing to spend that much money, then it is a highly recommended product. If you already have a Sony Playstation, then you can use it on your TV to make video calls. If you are willing to spend slightly more than you should consider buying a Skype Ready TV only (Panasonic, Samsung or Sony), it is your choice. Consider ready the review.